Shower your little ninja’s birthday party with Teenage Mutant Ninja Turtles Confetti! tiny purple and green stars and round cardstock cutouts featuring the faces of the ninja turtles. Sprinkle confetti on your table for a turtle-rific table setting or into envelopes with your party invitations or thank you notes for a totally suh-weet surprise! 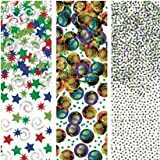 Package contains 1.2oz of Teenage Mutant Ninja Turtles Confetti in 3 designs. This entry was posted on Monday, November 11th, 2013 at 6:30 pm	and is filed under Pizzazz. You can follow any responses to this entry through the RSS 2.0 feed. You can leave a response, or trackback from your own site.